This is the update version of VeryPDF PDF to Image Converter. 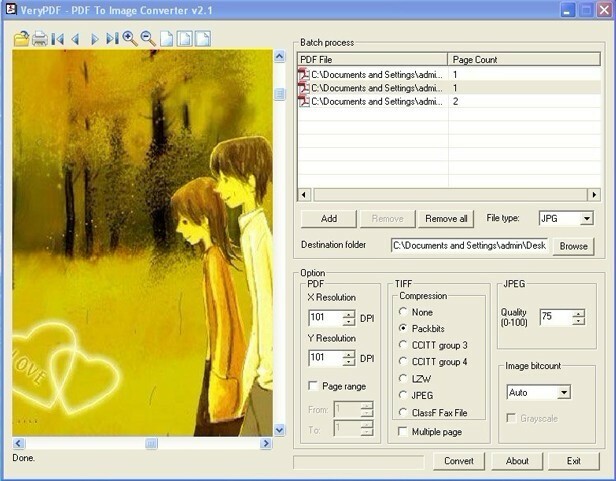 With PDF to Image Converter, convert you PDF file to image, such as, TIF, BMP, PNG, EMF, GIF, JPG, JPEG.etc. This software has a powerful output setting, you can resolute for generated images, set the color depth, range of pages, and preview your PDF files in the preview frame before conversion. 1.Support all PDF formast version and all PDF encryption modes. 2.Better to detect bogus PDF font encodings. 3.Able to ignore ToUnicode map if low ASCII duplicates found. 5.Support PACKBITS, CCITT Fax4/Fax3, LZW, Run-Length, JPEG, JBIG2, JPEG2000, FlateDecode compression modes. 6.Convert PDF to searchable vector EMF and WMF images. Statement: First, please download the orginal installation package by clicking the download link. Of course you may also download it from the publisher's website. Using VeryPDF PDF to Image Converter crack, key, patch, serial number, registration code, keygen is illegal. The download file hosted at publisher website. We do not provide any download link points to Rapidshare, Hotfile, Depositfiles, Mediafire, Filefactory, etc. or obtained from file sharing programs such as Limewire, Kazaa, Imesh, Ares, BearShare, BitTorrent, WinMX etc. Software piracy is theft. If you like VeryPDF PDF to Image Converter please buy it.